Get your order in now for the Blu-ray 3D of the horror remake and save $5 at Amazon! 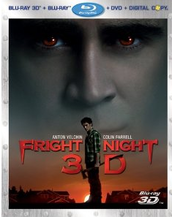 Amazon has already listed 'Fright Night - 3D' for Blu-ray 3D/Blu-ray/DVD/Digital Copy for pre-order and is offering a $5 off coupon for the upcoming release. Anton Yelchin stars as a teenager who suspects that his new neighbor (Colin Farrell) is a vampire.